From the director of Race to Nowhere, the popular 2010 documentary on our education system that has become a long-running grassroots phenomenon, and a new film, Beyond Measure, comes a groundbreaking book for parents, students, and educators on how to revolutionize learning, prioritize children's health, and re-envision success for a lifetime. From kindergarteners to high-schoolers, millions of American students are being pressured to perform in ways that make them less intellectually flexible, creative, and responsive to today's world. In Race to Nowhere, Vicki Abeles identified a widespread problem in our nation's schools: as students race against each other to have constantly higher grades, better test scores, and more AP courses than their classmates, they are irreparably damaging their mental and physical health. 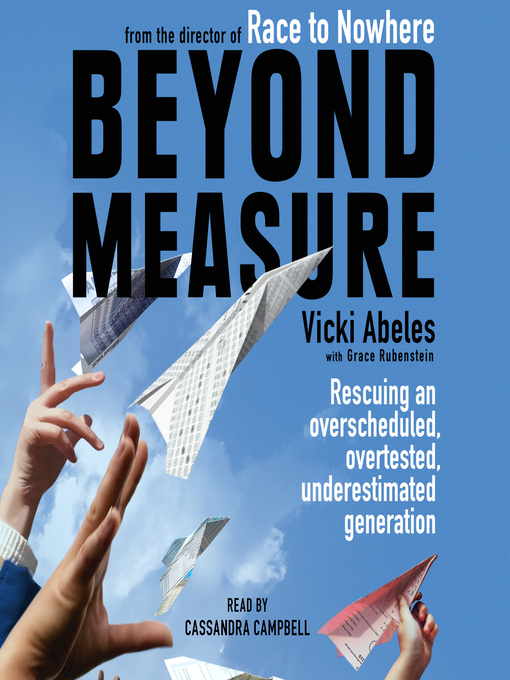 Now Abeles taps into this same grassroots community across the nation to find the solutions in Beyond Measure, which publishes simultaneously with the release of her new documentary. Pulling from powerful anecdotes and convincing new research, Abeles presents inspirational, quantifiable success stories and shows how anyone—students, parents, and educators—can effect change. Teachers who cut students' workload see scores rise; kids discover their own motivation once parents relieve the pressure to perform; schools that institute later start times have well-rested students who are able to learn more efficiently; and schools that emphasize depth over test prep find students more attentive, inventive, and ready to thrive. It's no secret that our education system is broken, and Beyond Measure inspires parents, educators, and students to take practical steps to fix it—starting today. In so doing, it empowers all of us to redefine learning and success, and to discover the true, untapped potential awaiting our children, not just in college, but in life.